Consultations are by appointment only; telephone 0151 290 4700. You can also book a routine GP appointment and cancel or check an appointment using our 24 hour automated service. The practice has introduced a new service called Online Services which can be accessed via the link at the top of this page. This will let you book your routine appointments with a GP online. You will need to register with the practice to access this service and once registered you will be given information that will enable you to create your username and password. As a patient you have the right to express preference as to whom you wish to see. The surgery offers pre bookable appointments with a GP of your choice. This may result in a delay if you wish to see a particular GP. A routine appointment is 10 minutes. If you have multiple problems, which you need to discuss with a GP, which may take longer than a routine appointment, please inform the receptionist so the length of your appointment can be increased if necessary. We now offer on the day appointments. If you would like to see a GP on the day please call the surgery. You will be asked to attend at a specific time and will be seen by the doctor on duty. Unfortunately you will not be able to see a GP of your choice. There are a limited number of telephone consultations available if you feel these would suit you rather than visit the doctor. Please contact reception for further information. If you wish to speak to a doctor or nurse please try to ring before 10:30. Please give your name and number to the receptionist and a message will be given to the doctor or nurse who will return your call. Appointments via telephone are available each morning. Please call the surgery for more information. 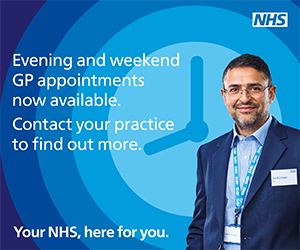 The practice now has a number of extended hours appointments available they are provided by our out of hours provider St Helens Rota. Appointments are available after 6.30pm and also at the weekend , appointments will be at Albion Street Clinic in St Helens. Car parking is available. Whilst we encourage our patients to come to the surgery, where we have the proper equipment and facilities available, we do appreciate this is not always possible. In this respect, if you do need a home visit, you can help us by calling reception as early on the day as possible. Generally speaking children will not come to any harm by being brought down to the surgery, and they will be seen by the doctor much sooner. If you are concerned please telephone: 0151 290 4700. Data includes no of fit notes issued, no of patients record as unfit/maybe fit to work, duration, gender, health condition, location, whether adaptations were recommended. If you DO NOT WISH for this data to be extracted from your medical record.